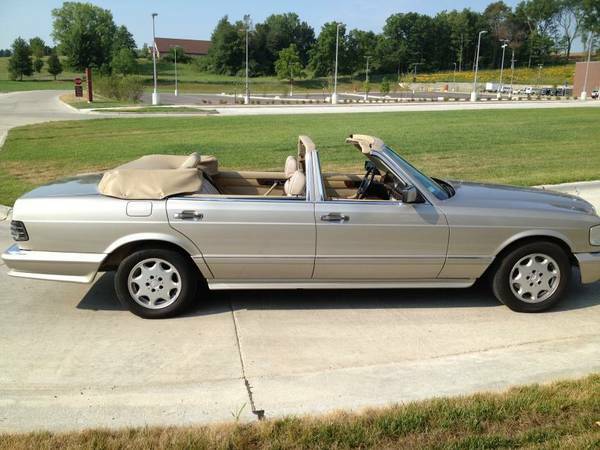 Home Market Watch	Rare Mercedes Benz 560SEL Convertible For Sale – The Only W126 Convertible in the U.S.? These cars have long wheel bases and while it looks like they left the B pillar in the car, so when the top is down there is a sort of ‘roll bar’ that is made up of the B pillar. Forget the way it looks, I have to think the structural integrity of the car has been compromised to some degree… but I’m not engineer, I think you’d have to look at the car and see for yourself. Rare indeed, I don’t even think they used one of these in Miami Vice. There is a video walk around of the car… scroll all the way down… where the owner shows us some basics of the car. It does look like it’s in very good condition. The interior looks very nice and it is said to have just 79,000 original miles. In the video the owner mentions that it is a power top, although doesn’t demonstrate the top in operation. I dare say it’s quite a sight to see… I’ve got to assume its a hydraulic powered top, again, you’ll have to get more details from the owner. The asking price in one listing I saw from early June was $15,000, it looks like it has been reduced to $12,500 at this point, the car is advertised on Craigslist in Iowa. I dare say it will take a few thousand dollars of additional discounting before this car is actually sold. The W126 market is fairly soft, even for great examples. A stock Mercedes 560SEL can be hugely expensive to maintain, especially if they haven’t been maintained regularly over the past 20+ years… an example such as this, with an essentially, one off, power, convertible could mean HUGE repair bills in the future. 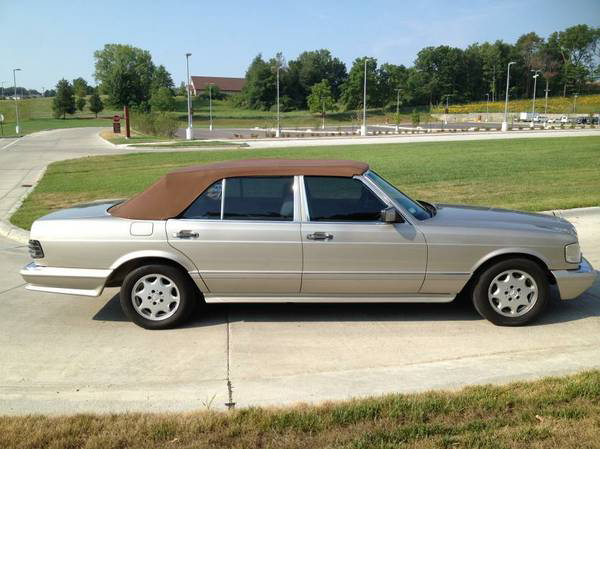 There certainly is some 1980s ‘Pimp Appeal’ in this car… reclining rear seats, smoke silver exterior (read gold). I’d be a player in about the $8,000 range. 2014 Mercedes CLA250 Video Review – CLA250 Looks Good in Jupiter Red, Drives Even Better! J’adore. Mais impossible à homologuer en France.